Why Choose Solstice Over Other Residential Treatment Centers? As one of the country’s most effective residential treatment centers, Solstice provides teenage girls with an approach to healing that has been specifically developed to fit their needs. 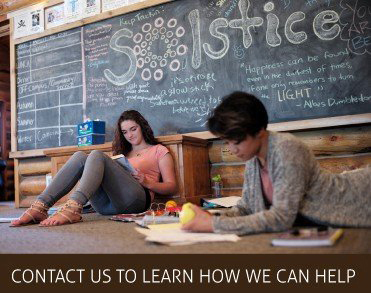 Whether it’s our uniquely designed therapeutic programming, or the clinical specialization and collaboration of our therapists, Solstice is highly qualified to address the complex needs of adolescent girls on the road to healing. Solstice creates a safe, secure environment for teenage girls. This allows them to follow a path of self healing and reflection. Our program is family-focused and puts an emphasis on keeping in constant contact with our girls’ families through family therapy sessions, family seminars, multi-family groups, and experiential interventions. At Solstice, self-sustaining, lifelong change is created through remarkable people and programming. At Solstice, the close-knit environment created by the milieu on campus encourages life-long friendships and positive growth. Unlike other residential treatment centers, Solstice utilizes a combination of individual, family, group, experiential, and equine therapy to maximize the therapeutic experience of our students. Residential Treatment Centers (RTCs) are inpatient health care programs that provide therapy for behavioral issues, mental illness, or drug and alcohol abuse problems that go beyond the capabilities of normal therapy methods. Residential Treatment Centers geared toward teens provide treatment for issues and disorders like oppositional defiant disorder, depression, ADHD and bipolar disorder. Residential Treatment Centers oftentimes build communities of people who suffer from these conditions and utilize the community setting to heal their clients. Additionally, they provide a safe, comfortable environment for clients to solve these issues with trained professionals. Why the RTC program at Solstice? Solstice’s culture and approach are specifically developed to fit the needs of teen girls. The equine and addiction programs and clinical specialization and collaboration of well-trained therapists make Solstice, one of the best residential treatment centers, extremely qualified to cater to the specific needs of girls on a path towards healing and growth. This residential treatment center is family-focused and puts an emphasis on keeping in consistent contact with our girls’ families through family therapy sessions, family seminars, multi-family groups and experiential interventions. At Solstice, self-sustaining, lifelong change is created through remarkable people and programming. Solstice creates a safe, comfortable environment for adolescent girls to go down a path of reflection and peaceful healing. In a 2009 study examining the therapeutic approaches taken by Residential Treatment Centers, results indicated a marked change in the quality of interpersonal relationships. Students increasingly cared for and maintained their relationships, engaged in more intimate relationships with others, approached (rather than retreated from) others’ differences, viewed others more holistically, and accepted personal responsibility. Additionally, a 2006 study suggested that at arrival at a residential treatment center, female youth are often more troubled than male youth. Despite this, at departure, “girls were rated as being more successful than boys by clinical staff”. They found that girls, regardless of the severity of their troubles, respond well to RTCs. In February 2014, actress and singer Selena Gomez spent two weeks at a residential treatment center in Arizona in order to “spend some time on [her]self in order to be the best person [she could] be”.